This is where you will add more details and shading. If you just landed here, you'll want to go back to the beginning so I can guide you through the process. 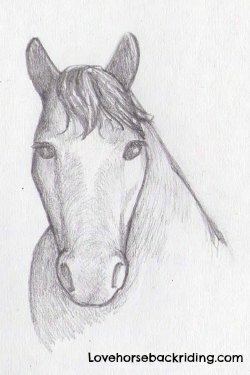 (i) Lightly shade in the ears and the left side of the forelock. This helps to give the eyes some depth. (iii) Add shading to the left side of the head. Use the picture above as you draw. This represents the horses' back and keeps the head from looking like it is floating in space. When you draw this you can see that it starts about at the top of your two vertical nose lines and that it ends well below the bottom of the nose. If you look you can see that this shading is in line with the right hand vertical line down into the nostril area. And your creation is done! When your work doesn't turn out like you wanted it to, don't get discouraged. It takes a lot of tries when you are first learning to finally get the look you want. 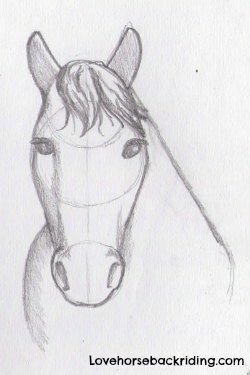 Keep trying by doing this and my other horse drawing tutorials more than once.